The number of techniques for making large-scale parts with 3D printing and additive manufacturing (AM) is growing along with part size. 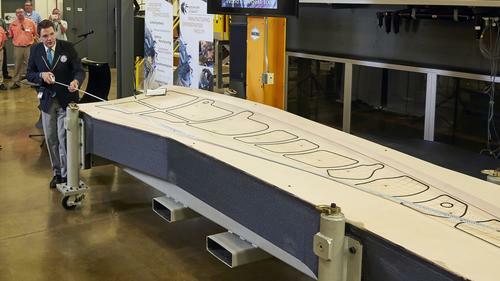 We've reported on several, including Sciaky's, the Stratasys Infinite Build demonstrator, and the Big Area Additive Manufacturing (BAAM) machine developed by Oak Ridge National Laboratory (ORNL), used to 3D print the composite Strati car at IMTS 2014. The biggest of all, according to Guinness World Records, is a 3D-printed trim and drill tool that measures 17.5 ft x 5.5 ft x 1.5 ft. It now holds the world record for the largest solid 3D-printed item. Researchers at ORNL built the tool to be evaluated by Boeing for use in constructing the aircraft leader's 777X passenger jet. Boeing's flagship 777X twin-engine passenger jet builds on the success of the company's 777 and 787 Dreamliner, but it will be even bigger. Its newly designed longer composite wings will maximize fuel efficiency. Boeing's flagship 777X builds on the success of the company's 777 and 787 Dreamliner, but it will be even bigger than either of those. Boeing says this aircraft will be the biggest and most efficient twin-engine jet in the world, as well as one of the most comfortable. Compared to the interior of the Dreamliner, the cabin of the 777X will be wider, with bigger windows and newly designed lighting. It will also feature touchscreens in the flight deck for pilots, a first in air transportation. 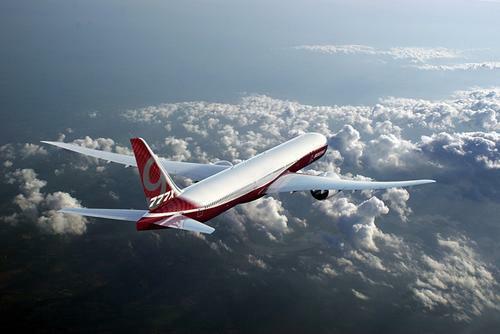 The 777X jet will have newly designed, completely optimized, longer wings. The design of the plane's high-efficiency, high-span composite wing enables a 23 ft (7m) greater span for maximizing fuel efficiency. In flight, the plane's wingspan will measure 235 ft, 5 inch (71.8m), and on the ground, 212 ft, 8 inch (64.8m). Production of the plane is scheduled to begin in 2017 and first delivery is targeted for 2020. Guinness World Records judge measures the 3D-printed trim tool, co-developed by Oak Ridge National Laboratory and Boeing to be evaluated for use in constructing the wingskin of Boeing's new 777X passenger jet. The Guinness World Record-winning trim and drill tool will be used to secure the composite wing skin of the 777X during drilling and machining, before it is assembled. The tool itself was 3D printed at ORNL of carbon fiber and ABS thermoplastic composite materials. 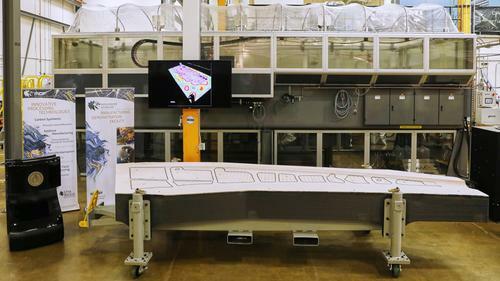 The research team at ORNL says the tool's length is similar to that of a large sport utility vehicle, and that it weighs 1,650 lb (748.43 kg). Changing the tools' materials and 3D printing it is saving a bundle in both time and money compared to traditional metallic tooling. ORNL printed the lower-cost trim tool in only 30 hours. "The existing, more expensive metallic tooling option we currently use comes from a supplier and typically takes three months to manufacture using conventional techniques," said Boeing's director of structures and materials, Leo Christodoulou. "Additively manufactured tools, such as the 777X wing trim tool, will save energy, time, labor, and production cost and are part of our overall strategy to apply 3D-printing technology in key production areas." A 3D-printed trim and drill tool developed by ORNL and Boeing to be used in building Boeing’s 777X passenger jet has received the title of largest solid 3D-printed item by Guinness World Records. In the background is the Big Area Additive Manufacturing (BAAM) machine researchers used to build the tool. Guinness World Records judge Michael Empric measured the trim and drill tool to prove it exceeded the minimum dimensions of 0.3 cubic meters, or about 10.6 cubic feet, to qualify for the record title. The measurement was performed at an awards ceremony held at ORNL's Manufacturing Demonstration Facility, which houses the BAAM machine used to 3D print the tool. After verification testing is completed by ORNL, Boeing plans to use the additively manufactured tool in the company’s new production facility in St. Louis. It will then be able to give the lab feedback on the tool’s performance.